It's not a secret that Olympics athletes tend to gorge themselves on the free McDonald's offered in the Olympic Village after they're done with events. Usain Bolt famously said he ate 1,000 chicken nuggets at the 2008 Beijing Games. 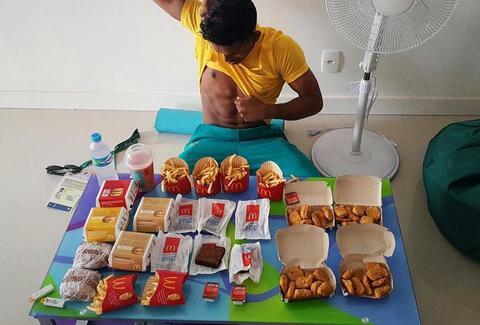 Australian badminton player Sawan Serasinghe posted a photo of himself with 8,000 calorie pile of McDonald's in Rio. The massive amount of food being ordered at McDonald's is probably aided by it being free for athletes, and maybe it's tied to reports that venues are running out of food. Either way, athletes are eating so much McDonald's that the chain's Olympic depot had to start enforcing an order limit, according to the Washington Post. Athletes are being limited 20 items per order. Part of the need for limits, according to reports, is that the workers at McDonald's aren't seeing a slow time. There's a line out the door day and night. That's in part because there aren't many options in the Olympic Village and the option that are present aren't always that appealing. "Normally, in the cafeteria, the food isn’t good," says Cuban judoka Idalys Ortiz. With a line out the door and each person ordering so many items, the kitchen is getting backed up. Athletes are reportedly allowed to ask for more than 20 items if they need to, but their order drops in priority to anyone ordering 20 items or fewer "adding minutes to the already hefty wait." What does a 20-item order look like? Serasinghe's 8,000-calorie gluttonous outburst was just over that threshold. For athletes like him, it's a small indulgence after going so long eating clean to do their best in Rio. Others say they're ordering an indulgent spread to bring food back to teammates. Either way, that McDonald's is getting worked.